Share "Choosing the Best Christmas Tree"
Real Trees: These trees are often more nostalgic and choosing and cutting your own tree can be a fun holiday tradition. Real trees have a fresh, piney smell, and they are available in a greater range of sizes, shapes and species than artificial trees. These trees will shed more needles and must be kept watered, however, and will need to be properly disposed of after the holiday season. They don't need to be put together, but they can be more expensive over time as a new tree must be purchased each year. Artificial Trees: These trees come in standard shapes and sizes, without worry about bare spots or lopsided growth, but they do not always look as attractive as a real tree, and they lack that characteristic fresh smell. If the artificial tree is reused many times, it can be much less expensive than real trees, and pre-lit trees are easier to assemble and decorate. They do need to be stored after the holidays, however, and if pieces are lost, it can be difficult to find replacement parts. Ultimately, you need to choose whichever tree works best for your needs. For some families, pulling out the battered tree box and painstakingly assembling it can be just as nostalgic and part of the holiday season as visiting a tree lot or farm, and both trees can be beautiful additions to Christmas decor. Family: A very tall, full tree can be time consuming to decorate. A small family may prefer a smaller, more manageable tree, but a family with young children might want a larger tree for those wonderful childhood memories. Also consider pets and personal allergies when selecting a Christmas tree. Retailer: Different retailers may offer a different selection of either real or artificial trees. Shop around for the best tree, taking into account whether you prefer to support local or regional businesses, larger stores or individual business owners with your purchase. Cost: Christmas trees range from $20 or less for small, simple trees to $500 or higher for larger, lusher trees. Shopping around can yield vast price differences and significant savings. Consider the cost of decorations, stands, storage or disposal as well. Species: There are many different types of pine trees, and the needle length, shape and color can be significantly different between species. Some trees have cones while others don’t, and the bark color and texture also varies. If one type of tree means "Christmas" to you, be sure to choose a tree of that species so you aren't disappointed with the overall look. Size: Christmas trees can be tall or short, full or thin. When selecting a tree, consider the size and shape of the room where it will be displayed, taking into account room for furniture, decorations (don't forget the topper!) and gifts. You will also need to access the tree easily to turn lights on and off, add water to a real tree or when decorating. Fullness: Some trees have very dense branches and needles, while others are more sparsely grown with plenty of space in their structure. Consider the size and quantity of ornaments, lights and other decorations to be sure they don't get lost in a full tree, or that a bare tree doesn't look too empty. Stand: Trees need a sturdy base to be held upright. Artificial trees usually come with a built-in stand or base, while you will need a separate base for a real tree that can hold water to keep the tree moisturized. If you choose a real tree, check the trunk size to be sure it can fit the stand firmly and is straight to stand tall. Storage: Unless you will be decorating a real tree as soon as you bring it home, you will need a cool place to store the tree until it is time to put it up. 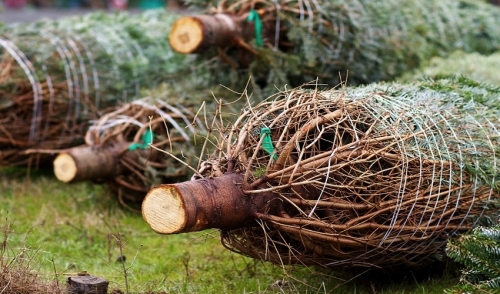 Artificial trees will need to be stored year-round. Be sure you have the appropriate space to safely store the tree you choose. After Christmas: Don't forget what you will have to do to the Christmas tree after the holiday – taking off the decorations and storing or disposing of the tree. Real trees may be able to be recycled or potted trees can be planted, while artificial trees need disassembling and safe storage. There is a lot to consider when choosing the best Christmas tree, and what is best for one person or family isn't necessarily best for everyone. By carefully considering your personal preferences, you can find the perfect tree to be your holiday focal point.